This article originally appeared in our technology partner, Workfront’s Blog, and we thought our readers would find it interesting! It’s a common refrain whenever a team adopts a new technology. Almost without exception, what’s new requires going through a learning curve, and so by definition change is hard. And yet as a leader, it’s your job to motivate your employees to adopt new technology and ensure a transition that, while maybe not completely seamless, makes your team better than it was before. As you’re leading the adoption of something new at your organization, here are six ways to make the process smoother. When we talk about adoption, we’re talking about getting people to buy in to the change and to see the value they’ll gain from the change. In this sense, adoption isn’t about nitty-gritty technological details or usage numbers. Instead, adoption is about people. The users of your new software platform will make or break the adoption process for you. If you can lead them to make the change, then comprehensive, deep, and successful adoption will follow. If you can’t, you’ll struggle with adoption — regardless of the technology. 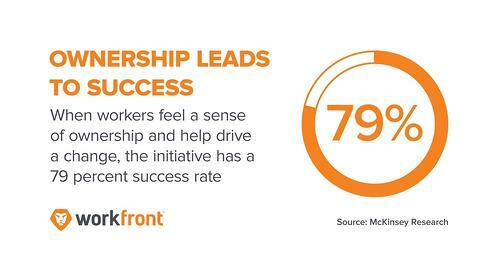 One study by McKinsey found that when workers feel a sense of ownership and help drive a change, the initiative has a 79 percent success rate. If you want change to work, you need to keep your team engaged and invested. Your team probably already trusts you as their leader, but now is the time to gain trust in your decision to make a change. Start by making sure you know exactly how the change will impact the individuals on your team, not just the team in general. Get to know what their processes are and how they do their work from day to day. It’s also essential that you get insight into what kinds of challenges team members face, what their expectations are, and what concerns they have for the change. Ignoring issues your team has implies that you aren’t aware of them or that you don’t care what your team is dealing with. The easiest way to find out what your team is thinking and feeling? Talk to people! Knowing exactly how your team works and respecting people's reservations will help you gain the trust you need to initiate change and tell you what you need to know to make the transition as smooth as possible for your team. After you’ve established trust with your team, the next step is to look for and cultivate influencers — the people who hold the biggest sway over the way people on your team behave and the decisions they make. Think about the people in your office who have authority, knowledge, or position (either real or perceived). People with these qualities are your influencers, and it’s important to know who they are because they can help you win over otherwise skeptical team members and make transitioning to new technology easier. Involve influencers in the planning and decision-making. Grant them early access to the new tools. Value their feedback. If you do this, you’ll gain powerful ambassadors. As the people your team respects take on change — and your team sees them do it successfully — the rest of the group won’t be far behind when it comes to jumping on board with new technology. One sure way to intimidate employees and make them resistant to change is overwhelming them with new information, a new system, and new processes all at once. Introduce things slowly, simplify the new system as much as possible, and take things one step at a time. Instead of holding an hours-long training session where employees are expected to learn the new technology inside-out and upside-down right away, have a series of quick sessions where you highlight a few key features that will make their work easier. Remember how you spent time building trust by listening to your team members’ unique needs? Now is the time to leverage that knowledge. Use the new technology to help solve problems. It will mean a lot to your users that you not only listened to what they had to say, but you also took action. Tailor training to the unique needs of your team and use the training to generate excitement for a new tool that will make work easier. Successful adoption takes time. Set realistic expectations for how the new technology will replace your current methods and implement it at a pace everyone is comfortable with. Communicate often about upcoming changes and new technologies. Clear and frequent communication helps your teammates feel like they’re in the know and are part of the process. Open communication can also help eliminate reservations and clear the way for a more streamlined adoption process. What’s coming? Communicate early in the process that change is coming and what it will involve. Why change? 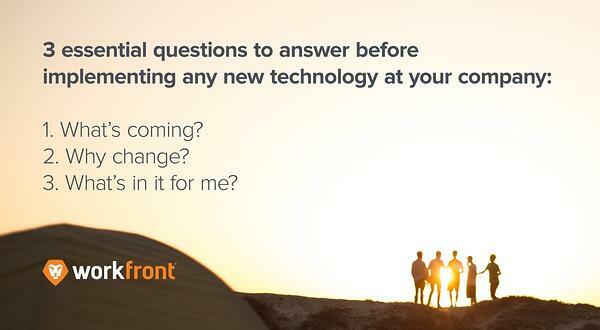 Tell everyone why the change is necessary and why you have chosen this specific technology. What’s in it for me? Communicate to workers how the technology will simplify their work on a personal level, not just how it benefits the company. Communication can happen during formal training, in status update meetings, via email, and one-on-one as you help employees navigate the change. The details of what you communicate depends on your audience. The more you can answer “why change?” with information relevant to a worker’s role in the company, the more likely she’ll be to embrace the change. What we often fail to realize is that adoption doesn’t end a few weeks or even months after a launch. Adoption is a continual process that involves listening to feedback, making changes, holding additional training, and breaking bad habits. The extraordinary goal we’re trying to reach is having all users consistently and efficiently using the new technology. That isn’t going to happen quickly. Our best advice is to break down this large goal into smaller, attainable parts. Remember to reiterate why you’re doing this every step of the way. While there isn’t a magic key or golden ticket (we wish!) 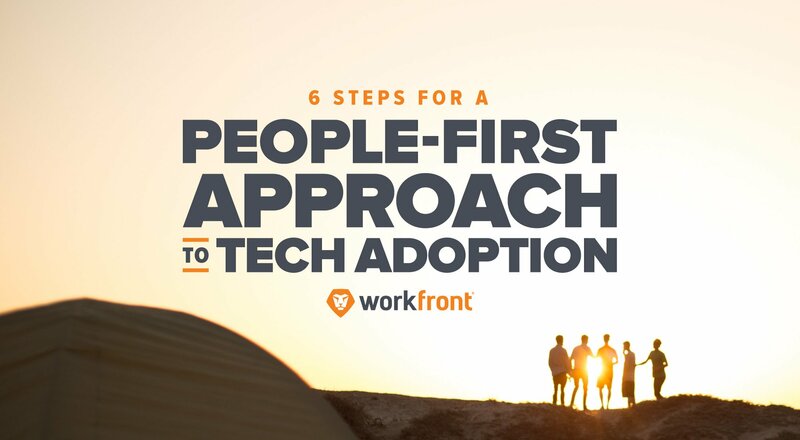 to making technology adoption completely painless and easy, these six tips will help you make it a smooth ride for your team. The trick is to focus on people by making sure they don’t get lost in the process and that every step you take toward adoption is tailored to their needs. If you do this, you’ll find that adoption will be far easier for you. And who knows? You might not hear “this is too hard!” ever again. Written by Aubrey Hayes, Workfront Senior Training Strategist, and Allison Lippert, Workfront Training Manager at Workfront. Looking to Streamline your Marketing Workflows? We've got you covered!